Roger Griffin is Professor in Modern History at Oxford Brookes University and lectures principally on aspects of the History of Ideas relating to ideologies and values that have shaped the modern world. 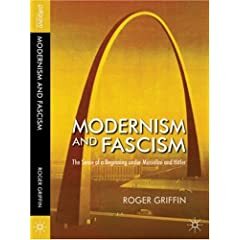 His latest book is Modernism and Fascism: The Sense of a Beginning under Mussolini and Hitler (Palgrave Macmillan, 2007). In the same interview Goldberg states:"If I had to pick a single overall theme in the book, I would say it’s to rectify the misunderstanding of what fascism is and to highlight the deep historical, ideological and emotional ties between progressivism (now called liberalism) and fascism." Note: a) his disingenuous claim that the book sets out to correct misunderstandings about fascism (rather than admitting that it hijacks the term fascism and attaches it to social or democratic liberalism for strictly propagandistic ends; b) his candid admission that he is seeking to establish continuities between fascism and progressive liberalism, in other words that it is tendentious and propagandistic in its very conception. Griffin: An Academic Book - Not! I read the definition of Fascism in the Griffen essay. I am not use to an ideology being defined by what ideologies it is opposed to rather than what policies supports. Do historians typically define an ideology in this manner? I can define modern socialism, American conservatism, American Liberalism and Libertarianism without mentioning any of these ideologies' opposition to any other ideology. It seems strange that the same cannot be done with Fascism. Perhaps there is no such coherent thing as Fascism and what is called Fascism is really the speaker/writer saying that they do not like a particular group. Perhaps a listing of policies that Fascists support would help clear this up or a coherent theory of acceptiable policies like Libertarians have would clear this up. Without that, it seems that Fascist is an epitath rather than a coherent description of a person's political views. Ernie...this is the point of The Nolan Chart, is it not? To create a political spectrum frame that valorizes libertarianism and lumps communism and fascism together as totalitarian? The following is excerpted from an article I have written concerning the new political spectrum advocated by right-wing ideologues. For a very long time, the extreme right in our country has sought to re-invent our understanding of what a political spectrum should signify or convey. The fundamental underlying premise of the new proposed spectrum is that government is our mortal enemy. Furthermore, the premise is that history proves indisputably that government is evil and dangerous and it always diminishes freedom and facilitates tyranny. Therefore, the more government activism or intervention within a society -- the less freedom exists within society. This conception of a political spectrum posits a continuous sequence of government activist ideologies (i.e. “statism” or “collectivism”) in which adjacent elements are not perceptibly different from each other, but the extremes are quite distinct. Consequently, the new proposed spectrum places anarchy [no government] on the extreme right and totalitarian dictatorships [total government] on the extreme left. But the key to understanding this proposed spectrum is that all forms of statism are said to originate exclusively from left-wing sentiments. Seen from this perspective, the more government intervention in our lives, the more that government controls or regulates human affairs, the less freedom exists and the more opportunity for tyranny to flourish. Consequently, seen from this perspective, the worst violators of human freedom and dignity in all of history have been those governments which maximized government intervention, i.e. totalitarian dictatorships — and believers in this conception don’t see much point in distinguishing between nazi, fascist, or communist ideology since they ALL resulted in horrific crimes against humanity. The new proposed "middle" or "center" of the political spectrum consists of those who propose that liberalism, socialism, communism, fascism, and nazism are ALL forms of "collectivism" or "statism" (aka PRO-government activism) and, consequently, they inevitably produce or lead to tyranny – so not much point in making fastidious distinctions between or among them. Groups whose ideology we currently consider “extreme right” (such as the John Birch Society) place themselves in the CENTER of the new spectrum because they claim to be anti-statist since they favor "limited government". In essence, the new spectrum is a rather transparent attempt to pretend that everything despicable, dishonorable, frightening and dangerous originates exclusively from the LEFT side of the spectrum whereas everything decent, honorable, moral, and desirable may be found exclusively in the center and center-right side of the spectrum. Thus the REAL purpose behind this proposed new idea of a political spectrum is to create an “enemies list”. Collectivists/statists of all kinds (i.e. anyone who advocates utilizing the instrumentalities of government to accomplish anything within society—and that includes liberals, socialists, communists, fascists, nazis) are considered “the enemy” of human freedom. The new proposed spectrum subverts the idea that different types of the same thing may have materially important distinguishing features which make them incompatible with one another. Recognizing materially important distinctions permits us to understand ourselves and human history correctly. For example: All humans have blood, but if you are given the wrong blood type, you die.